Steve is a transplant from the West Coast. He spent his early years in Southern California and was baptized at the El Segundo congregation at the age of 10. His family moved from California to upstate New York just prior to the start of his senior year in high school. While there his family attended the Endwell church of Christ. After working a few years after high school at a Radio/Television station he attended Northeastern Christian Junior College in Villanova Pa. He moved to Florida after school to help support his mother and sisters who had moved to Jacksonville. Steve started attending the San Jose Congregation and worked with the youth there. It was there that Steve’s Mom introduced him to Nancy Koontz (the future Mrs. Berg). Shortly thereafter they all started attending the Dean Road church of Christ. While Steve’s Mom and sisters moved on Steve stayed in Jacksonville. Steve and Nancy were married at Dean Rd and raised their 2 children there. After a period time at the Arlington congregation where Steve served as a Deacon for several years they decided to come back to Dean Rd. It is Steve’s desire as an Elder to serve and build up the Dean Rd family and further Gods Kingdom in the local community. Gene grew up in the Arlington area of Jacksonville…attended Terry Parker High School, FCCJ, University of Maryland, Kennesaw State University and FSCJ. After retiring from CSX Transportation, he became licensed by the State of Florida to sell personal & commercial lines of insurance through State Farm. This profession requires “Continuing Education” credits, so he's officially a lifetime student. His children and their spouses are Christians. They have provided him with 8 wonderful grandchildren and two granddogs. There’s more than a dozen grandkids from couples at this congregation, who know and love him as “Poppy” and his wife, Belinda, as “Bimbe”. Gene served several years as an elder. His wonderful bride, Belinda (Kitchings), is from Chattanooga, TN and convinced him that he likes the Vols…and, he does. Previously, Belinda and Gene were team teachers for Grades 2 and 3, then they both were promoted to 4th, 5th and 6th Grade team teachers. It’s encouraging to see how quickly the youth absorb the scriptures with ability to grasp what God wants them to do. They really get it! Bottom line is that he wants to encourage everyone to reach maximum potential in serving God, knowing His Son and His Spirit and doing His Will. Theron has lived in Jacksonville for over fifty years. He is employed by the City of Jacksonville in the field of Public Safety. Theron serves as the Deacon of Safety and Security, and Deacon of Finance/Treasurer. 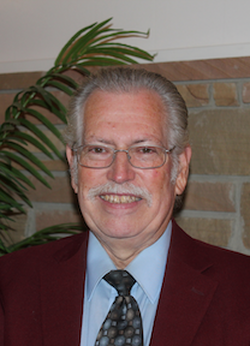 He served as Treasurer of Dean Road in year's past, followed by a time of service as Treasurer at the Arlington Church of Christ, before returning to Dean Road to assume the Treasurer's work. Justin Hirt was born and raised in the Washington, DC suburb of Herndon, VA. He holds a Bachelor's degree in Aerospace Engineering from Virginia Tech. It was during his time at VT that he met his wife, Ashley, learned the Gospel, and put Christ into baptism in December 2004. After graduating in 2006, Justin moved to Jacksonville to take a job with the Department of the Navy at NAS Jacksonville. He has attended Dean Road since moving to Jacksonville and now is the proud father of three children; Fiona, Piper, and Lincoln. Justin looks forward to his work of bringing the Gospel to the world through the ever changing and evolving digital realm.